Langdon St. Ives is a retired professor who spends his time pursuing eccentric scientific hobbies. Recently he’d been building an airship in the barn on the country property that he and his wife Alice (who loves to fish) recently moved to after they left London. The airship was destroyed in his last adventure (see The Aylesford Skull), but Langdon never got rid of the elephant that he was training to open the panel in the barn roof that allowed the airship to ascend. By now the elephant is part of the family, as is their neighbor Harriet Laswell (who happens to be the mother of St. Ives’ greatest enemy, the evil Dr. Ignacious Narbondo), Langdon’s manservant Hasbro, and Finn (a young man who recently joined them and who helps takes care of the property). When Harriet asks Langdon to visit Sarah Wright, the witch who lives nearby and hasn’t been heard from in a while, it is discovered that Sarah has been murdered and beheaded, leaving behind Clara, a blind and mute clairvoyant daughter. Then Clara is kidnapped. But before Langdon realizes this, he has gone to London to join Gilbert Frobisher (his rich gluttonous friend) and Gilbert’s new gold-digging girlfriend who he recently met in Jamaica. Gilbert wants Langdon to accompany him on an excursion into the sinkhole that was formed when things blew up in the last adventure. Langdon saw Narbondo fall into that sinkhole, but he knows that his enemy never seems to stay dead. Langdon and Gilbert don’t yet know that this enormous sinkhole (which they caused) opened the way to a strange underground world beneath Victorian London. This is a dark dank place that’s lighted by forests of luminescent mushrooms… mushrooms that eat people. They also don’t know that the planned expedition is a trap concocted by an evil mad scientist who has discovered this underground world with the help of the dwarf who used to be Narbondo’s coachman. This scientist has developed a technique to extract the genius out of people’s brains. Even dead people. The procedure involves severed heads, electricity, and those glowing carnivorous fungi. Beneath London features one of Blaylock’s best settings. I loved the glowing tunnels, caverns, and fungi forest under the city. Langdon gets to explore these for a little while, but I wish we had spent even more time there. Despite the book’s title, most of the plot occurs above ground. I appreciate how, as the years go by (the first LANGDON book was published in 1984), Blaylock’s stories have been including more women, and these women are being given more important roles to play. By the way, in this story we learn how Alice and Langdon met each other. I always love the mad science in Blaylock’s stories, but this time it’s particularly gruesome and grisly. Usually Blaylock balances this out with his quirky highbrow humor and a fast-paced madcap plot. This time, though, the comedy is toned down and the story comes across much darker than usual. Macabre, in fact. The humor is there, but not as much as usual, and I thought this story needed more. The dry humor has always been my favorite aspect of Blaylock’s work. By the way, I’ve noted several times in my reviews of Blaylock’s work that there are always fish in his stories. This is the first time I’ve noticed that two of his main characters have “fishy” names: Gilbert and Finn. Coincidence? I don’t know. I listened to the 12.5 hour long audio version of Beneath London which was published by Audible Studios and narrated by Stephen Thorne. 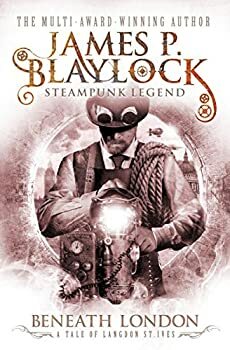 I thought he did a great job, though Nigel Carrington is still my favorite reader for Blaylock’s books. Hmmm…. “The Leech Woman,” followed by a book with vampiric mushrooms. I think Kat’s playing with themes today! I suspect that she does that very thing from time to time, just to see if we’re paying attention.